Looking for an Oriental themed slot that brings something new to the mix already available? 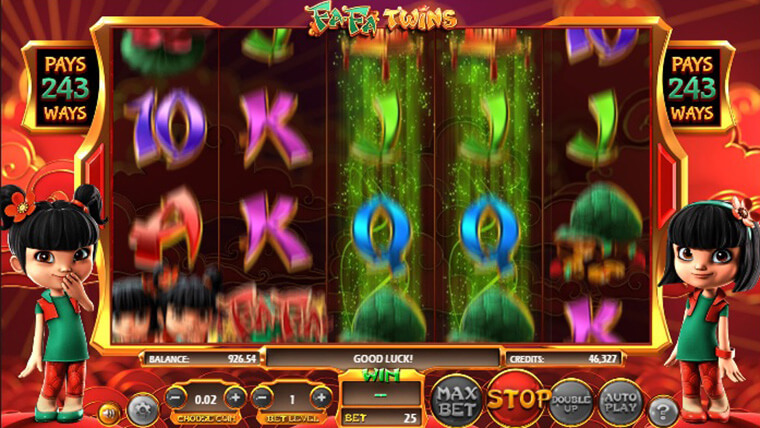 Try Fa Fa Twins by Betsoft. As all Betsoft games, the five reels, three rows and 243 ways to win video slot is just as graphically impressive and it also comes with intriguing bonus features. Apart from the 243 ways to win, the 95.29% RTP slot also has twin reels that spin together to rake up more wins. Dual reels – on every spin at least two adjacent reels will be identical, but this can spread to a third, fourth or even fifth contagious reel. Double Up Game – after every winning spin you can choose to double up that money. You can choose to gamble all of it or just 50% and then you will put your luck on a coin toss and choose heads or tails. If you win you double your stake.